What would you do if you suddenly developed super powers? This is the question posed by low budget sci-fi flick Chronicle. The plot is laudably simple. Three high school friends – popular class president to be Steve (Michael B Jordan), philosophical stoner Matt (Alex Russell) and his loser-ish cousin Andrew (Dane DeHaan) – discover a mysterious, glowing, pulsating force in a hole in the woods, which miraculously bestows on them the power of telekinesis. Exercising their new found skills 'like a muscle', their powers grow, particularly in the case of lonely misfit Andrew, who's also documenting their experiences on film (yup, this is another found-footage experiment). And, as every wannabe superhero knows, with great power comes great responsibility, so after messing with a few heads at the mall (oh c'mon, we'd all do it if we could) the group draw up some rules by which to govern their supernatural talents. 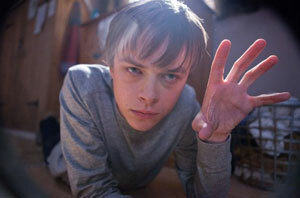 Laid out bare, the story and moral of Chronicle hardly sound new, but it's the execution that make this film shine. True, the hand-held format doesn't always work, at times raising more awkward questions than it answers. (How come someone is always filming whenever anything significant happens? Who has knit together this tale from the disparate snippets of footage? Why does Andrew's camera never break when dropped from the height aircraft fly at?) But the strong, natural performances from the central trio and the naïve, small-picture decisions their characters make, coupled with the sheen of reality created by the low-key settings and the documentary style, all conspire to lend the film a freshness and immediacy that's both compelling and credible. Part rite of passage movie, part superhero adventure, this Lord of the Flies meets Spiderman mash-up is quirky, fun, exciting, thought-provoking and definitely worth catching.